Receive Next (RCV.NXT): The sequence number of the next byte of data that is expected from the other device. This marks the first byte in Receive Category #3. All previous sequence numbers refer to bytes already received and acknowledged, in Receive Category #1+2. Receive Window (RCV.WND): The size of the receive window advertised to the other device. This refers to the number of bytes the device is willing to accept at one time from its peer, which is usually the size of the buffer allocated for receiving data for this connection. When added to the RCV.NXT pointer, marks the first byte of Receive Category #4. The receive categories and pointers are illustrated in Figure 220. This diagram is the complement of Figure 219, showing how the categories are set up for the receiving device. Categories #1 and #2 have been combined since there is no differentiation between received and unacknowledged and received and acknowledged. 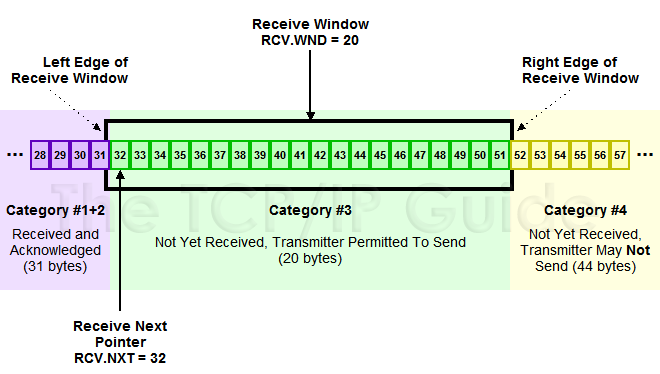 This example shows the state of the receiving device prior to receipt of the 14 bytes that in Figure 219 have already been sent. Key Concept: A set of receive pointers are maintained by each device, which are the complement of the send pointers. A devices send pointers keep track of its outgoing data and its receive pointers the incoming data. The two receive pointers are RCV.NXT, which indicates the number of the next byte of data expected from the other device, and RCV.WND, which is the size of the receive window for that device. The RCV.WND of one device equals the SND.WND of the other device on the connection.